Pedestal displays come in all shapes, colors, sizes and types. Whether for retail, art or museums, the concept is the same: putting focus on a meaningful item. 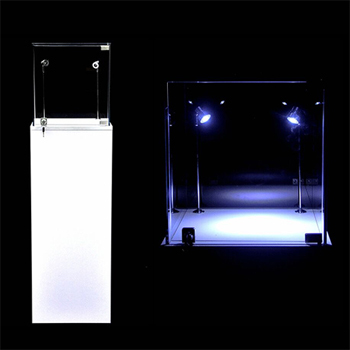 Pedestals can be used as a simple stand alone display or with others to create a dramatic presentation. 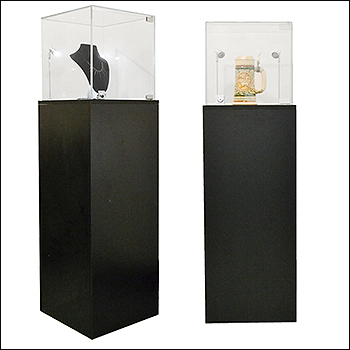 Pedestals can have a flat top, glass showcase top or even recessed tops typically used for retail "grab" items. Prices can fluctuate from knock-down economy units to custom extravagant displays with experiential add-ons. If you do not find what you need below, please give us a call as we have fabricators that can make the display you want. Be sure to check out the gallery below for ideas on what we can do.